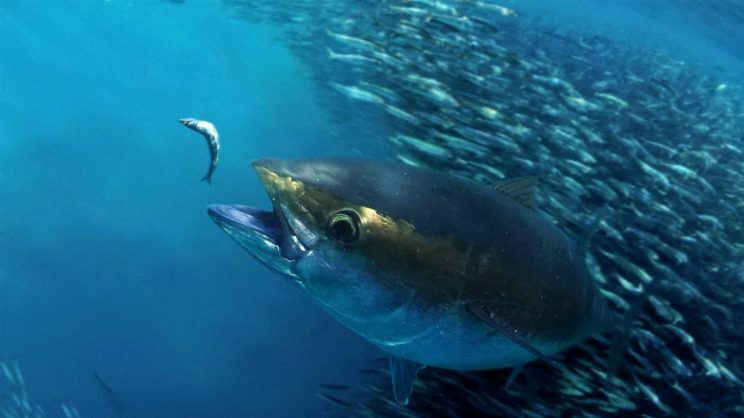 It’s simple – if the already overfished bigeye tuna catch isn’t regulated, stocks will collapse within two decades, according to scientists. Dozens of nations today failed to agree on measures to preserve one of the planet’s most valuable fish: the bigeye tuna, backbone of a billion-dollar business that is severely overfished. About 50 countries as well as European Union member states wrapped up a meeting of the International Commission for the Conservation of Atlantic Tunas (ICCAT) in the Croatian seaside city of Dubrovnik without reaching a consensus on quotas. “It’s a setback and it’s bad news,” said Javier Garat Perez, secretary general of the Spanish fishing confederation Cepesca. Scientists shocked many in the industry last month when they warned that unless catch levels are sharply reduced, stocks of the fatty, fast-swimming predator could crash within a decade or two. They warned that populations had fallen to less than 20 percent of historic levels. Less iconic than Atlantic bluefin but more valuable as an industry, bigeye (Thunnus obesus) — one of several so-called tropical tunas — is prized for sashimi in Japan and canned for supermarket sales worldwide. Three years ago, ICCAT introduced a 65,000-tonne catch limit for the seven largest fishers of bigeye, and a moratorium in certain areas of ocean. But other countries are not bound by the quotas, and bigeye hauls last year topped 80,000 tonnes — far too high to begin replenishing stocks. The Dubrovnik meeting saw calls to bring countries fishing more than 1,575 tonnes such as Brazil, Senegal, Guatemala and Cape Verde under quotas but these were blocked due to commercial interests, many delegates said. “The industry wants to make money and in the quickest way it can,” said Siphokazi Ndudane, who headed the South African delegation at the talks. The current quota of 65,000 tonnes was extended for a year as well as a partial moratorium on Fish Aggregating Devices or FADs: buoys or floats tethered to the ocean floor with concrete blocks which attract certain types of fish. The last proposal at the conference was made by South Africa which suggested a quota of 62,500 tonnes from 2019 to 2021. Some disappointed delegates sounded the alarm. “If we don’t reach consensus next year, it’s catastrophe,” said Yvan Riva, president of the French fishing organisation Orthongel. The various players also traded blame. But one member of a coastal African nation said it was a “lack of will” on the part of the big fishing nations. Some experts have calculated that cutting the total catch to 50,000 tonnes per year would give bigeye a 70 percent probability of recovery by 2028. Some delegates said the ICCAT had not taken in the lessons from the bluefin tuna. In 2007 when one species of bluefin (Thunnus thynnus) was put on the UN list of threatened species, the ICCAT was forced to adopt drastic protective measures in the Atlantic and Mediterranean and stocks began to recover. In Dubrovnik, after lengthy negotiations, the ICCAT put in place its 2019 management plan including relaxed fishing periods and for developing countries, the opportunity to set up bluefin tuna fattening farms. “Bottom line, there are simply too many boats in the water chasing too few fish,” said Paulus Tak, a senior officer for the Pew Charitable Trusts, and an official observer at the ICCAT meeting, about the bigeye tuna situation.